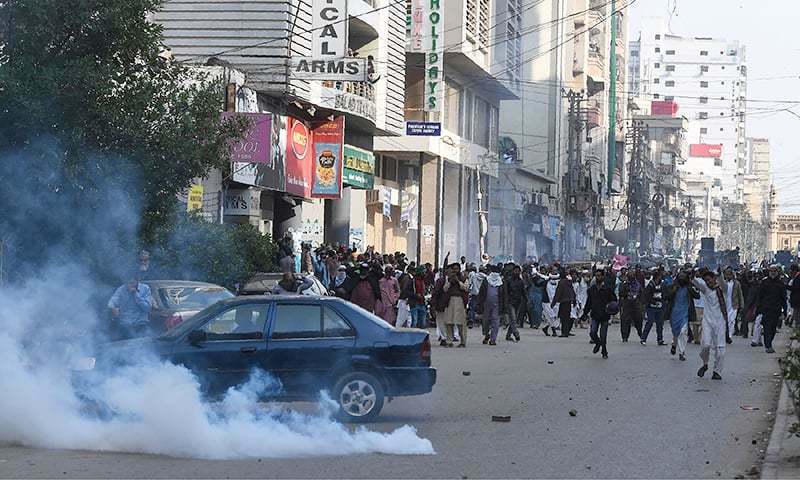 Karachi, February 1 (Dawn): Pakistani police on Friday resorted to tear gas shelling and baton charge to disperse protesting activists of the Tehreek-i-Labbaik Pakistan (TLP) in Karachi, officials and witnesses said. At least 50 TLP workers were detained as the protesters demonstrated against the Supreme Court’s recent decision touphold the acquittal of Aasia Bibi, a Christian woman who spent eight years wrongfully accused on death row in a blasphemy case. DIG East Amir Farooqi toldDawnthat police had already asked the party to desist from holding any protests. The officer claimed that the religious party’s workers pelted stones on moving vehicles, damaging the windows of many of them. They also allegedly damaged a police mobile. Police sources revealed that 12 more TLP workers were detained in the city’s West zone on Friday morning. Meanwhile, a TLP spokesperson toldDawnthat the party had planned a “peaceful” protest march from Bahadurabad to KPC but that the police subjected their workers to “executive highhandedness” to foil their protest. “However, hundreds of the workers reached the press club and held a peaceful demonstration,” he added. The orders further stated that the Sindh Inspector General of Police Dr Syed Kaleem Imam had recommended to the Sindh government to detain TLP workers for 30 days under MPO 1960.